○ More and more well-to-do Chinese women are choosing to give birth in the US because of the availability of pain relief. ○ Many agencies catering to this need have appeared in recent years. ○ Due to a lack of pain-relief specialists and outdated ideas, less than 10 percent Chinese women receive painkillers during labor. It wasn't the American Dream that persuaded Ni Ni (pseudonym) to pay hundreds of thousands of yuan to give birth in the US, but the promise of painless labor. "If I hadn't controlled myself, I would have burst into laughter in the delivery room. I felt no pain during the whole process. It was amazing," Ni, who gave birth to her second son in Los Angeles in March, recalled. 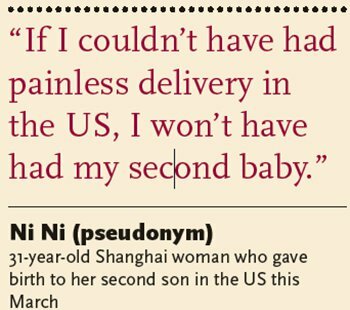 Ni, 31, says the birth of her first child in Shanghai in 2012 was an "unbearable" experience. "I vomited up every bite I had eaten during the birth. It was so painful that I almost lost my mind. If I had had a knife, I would have stabbed the people around me," she said. This is not an unusual tale. While analgesia (relief from pain) is widely offered in some nations' hospitals, a recent article published by domestic news portal thepaper.cn claimed that less than 10 percent of Chinese mothers receive it during childbirth. In a highly controversial recent case, a woman in Northwest China's Shaanxi Province, jumped to her death from a maternity ward window during childbirth due to the pain of labor. Ni said she feels blessed to have had another option. "If I couldn't have had painless delivery in the US, I won't have had my second baby," she said. 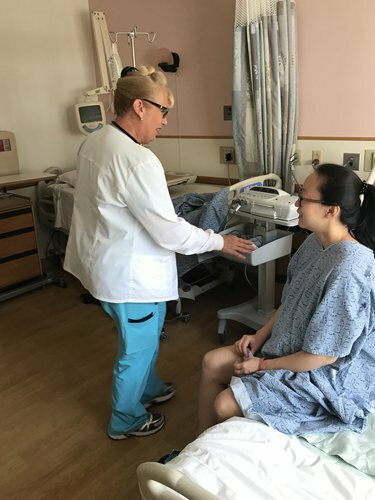 In the face of outdated attitudes and a shortage of pain-relief specialists in China, agencies have appeared to cater to the growing demand among well-to-do women for pain-free births in the US - with US citizenship for the baby an added perk. Ni had long been curious about pain-free childbirth in the US, but she said her desire to do it herself was reinforced after her first birth. "The US citizenship is not my ultimate goal. The child will still be raised and educated in China. I don't expect a foreign nationality will bring him too much benefit. It may be useful if he finds a job in a foreign enterprise in China," she said. Ni bought medical insurance and got a US visa prior to her pregnancy. The US airport's customs officers didn't question her intentions after she presented them with the required financial evidence and childbirth insurance, but simply allowed her to enter. Pang Baba, founder of the Xiduo Maternity Center, an agency that helps Chinese women give birth in the US, told the Global Times that pain-free delivery has become one of the main attractions for his clients. Pang encourages his customers to be honest with the authorities and to tell them that their reason for traveling to the US is to give birth pain-free. "I let them reveal their true intention of giving birth in the US. Telling the truth is more useful," he said. Pang's business has expanded from the country's metropolises to its second- and third-tier cities as demand continues to grow. Last month, he signed up 50 new clients. Pang said the trend started in 2013 after the film Anchoring in Seattle, which tells the story of a Chinese woman giving birth in the US so her child can get local citizenship, was screened in China's cinemas. While about 60 to 70 percent of American women receive analgesia during labor, according to US obstetrician and gynecologist Judy Zhu Pan Wei, Pang said 100 percent of his clients receive analgesic drugs. "My clients can have the strength to leave bed like Western women after childbirth, which is almost impossible for them when giving birth in Chinese hospital," he claimed, referencing the Chinese tradition of yuezi in which women remain in bed for weeks after giving birth. Women need to pay an anesthetist an extra fee to receive labor analgesia, ranging from about $500 to $1500. Pang's agency charges his clients a total of about 300,000 yuan ($46,005) for the whole package. In comparison, a Chinese hospital will only charge medical fees of about 2,000 yuan for a birth. The size of these fees has given birth to a whole sector. A simple search for "pain-free childbirth" and "the US" on Chinese search engine returns more than 10 agencies offering overseas birth services. An agency named Hainabian said in their advertisement that "to avoid painful labor, US pain-free birth is like a god." Weibo public account Fei Jie-Maternity, whose founder had labor analgesia in the US, uses her personal experience to attract clients. In one of its promotional articles, she documents the story of a Chinese woman who had painless childbirth in the US, which was in sharp contrast with her agonizing first birth in China. A lack of choice at home is part of the reason so many Chinese woman are choosing to give birth overseas. According to Wang Yuling, a gynecologist with nearly 1 million followers on Sina Weibo, most pregnant women do not have full control over their births, but share decision-making with older family members. Often these family members are able to override what the woman herself desires. "People from older generations have experienced the pain and think it's natural. They won't give permission for their daughters to have labor analgesia, worrying it may harm the baby," she said. Judy Zhu Pan Wei revealed that Chinese-Americans actually have lower rates of labor analgesia than white Americans due to this traditional fear. "But pain relief won't bring negative effects to the mother and the baby," she said. However, even if the woman and her family do decide to ask for pain relief, sometimes it isn't available due to a shortage of trained personnel qualified to administer it. "There is a shortage of anesthetists in hospitals. They need to cover major surgeries first. Besides, practicing labor analgesia won't produce scientific research. Clinicians still bear pressure in scientific research," Wang told the Global Times. It is common in Chinese hospitals for promotions to be based on the quantity of research produced by doctors. Making matters worse, the pain of childbirth has increased in recent decades in China, as children have gotten larger but women's pelvises have remained roughly the same size. Dong Lifang, a gynecologist at the Jianye District Maternal and Childcare Service Center in Nanjing, said in a previous Global Times interview that in the past, most babies in China weighed around 3 kilograms upon birth, but now 4-kilogram babies are increasingly common. 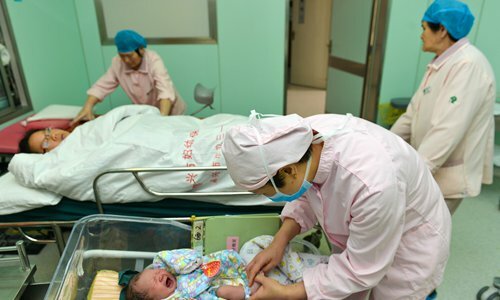 This, combined with the shortage of pain-relief doctors working in maternity, has led to an increasing number of caesareans being performed in Chinese hospitals. The WHO said in 2011 that 46.5 percent of births in China occur via caesarian, far above the organization's recommended rate of 15 percent. However, ironically, more pain relief drugs are used during caesareans than during vaginal births, according to Wang. "People can accept C-sections, but not labor analgesia. It reflects a lack of relevant knowledge," she said. One potential reason for hospital's lack of investment in labor analgesia and under-promotion of the concept is financial, Wang claims, as caesarians are more expensive for patients and make hospitals more money. Also, they take less time than vaginal births, which can require the participation of an anesthetist for an entire day. To change the current situation, Wang suggests that pregnant women should educate themselves and their families to ensure a correct understanding of pain relief. "Also, the system should be changed to enable hospitals to charge patients more fees for labor pain relief so that hospitals can hire more anesthetists and include the fee into public medical insurance," she said. What kinds of people cannot receive labor analgesia? Women who have received operations to their spine or lumbar as well as women whose platelet count is lower than normal. Is labor analgesia useful for all women? While around 95 percent of women may find labor analgesia useful, women who have given birth many times before or who are addicted to drugs may not find it effective. What are the side effects of labor analgesia? Is it necessary for all women to receive labor analgesia? It's not necessary. But if the woman has previously had a C-section and is now choosing natural birth, pain relief is recommended in case of an emergency.